Julie McBrien’s book From Belonging to Belief: Modern Secularisms and the Construction of Religion in Kyrgyzstan is a detailed ethnographic study of Islam and secularism in post-Soviet Central Asia. Julie explores belief and nonbelief, varying practices of Islam, discourses of extremism, and the role of the state, and shows the complex process of evolving religion in a region that has experienced both Soviet atheism and post-Soviet secularism, each of which has profoundly formed the way Muslims interpret and live Islam. McBrien shows how Islam is explored, lived, and debated in both conventional and novel sites: a Soviet-era cleric who continues to wield great influence; popular television programs; religious instruction at wedding parties; clothing; celebrations; and more. Her stories of believers whose lives straddle the Soviet and post-Soviet eras correct popular views; they reveal that the Soviet regime did not reduce religion to a symbol of identity but rather connected religion to identity in such a way as to ensure that religion—in all its varied forms and functions—survived. Dr. Julie McBrien is Assistant Professor of Anthropology at the University of Amsterdam and the director of the AISSR Research Program Group Globalizing Culture. She is senior researcher and co-coordinator of the ERC funded project Problematizing Muslim Marriages: Ambiguities and Contestations. McBrien has conducted research in Kyrgyzstan for nearly 15 years working on issues related to Islam, secularism, politics, gender, and marriage. She is author of From Belonging to Belief: Modern Secularisms and the Construction of Religion in Kyrgyzstan, University of Pittsburgh Press (2017). Her articles can be found in Material Religion, JRAI, Anthropology Today, and Critique of Anthropology. Your book From Belonging to Belief focuses on Islam and secularism in post-Soviet Central Asia, as seen from the small town of Bazaar-Korgon in southern Kyrgyzstan. How did you pick the place? What is the story behind it and what makes it special? I worked as a Peace Corps Volunteer (1998-2000) in Bazaar Korgon prior to becoming an anthropologist. A few years after finishing Peace Corps, I applied for a PhD position in a research project on religion and civil society run by Chris Hann at the Max Planck Institute in Halle, Germany. When I thought about what kind of research I might do in the context of that larger project, it was just so easy to imagine conducting research in Bazaar Korgon. I already knew the place and the people so well and I had long been curious about a number of things that easily translated into research questions. For example, the town had a very large, centrally located, highly visible mosque. Yet Kyrgyzstan had reached the nadir of its immediate post-Soviet economic decline while I was a volunteer. I wondered how people in town had managed to build the mosque despite these financial strictures. I was equally curious as to why they did it. There weren’t that many mosques in Kyrgyzstan at the time, so I was interested in why it had happened in Bazaar-Korgon, of all places. Bazaar-Korgon rayon Friday mosque, 2009. Many consider the religious awakening in Kyrgyzstan to be particularly noteworthy. Would you agree and why? I do. I think that there has been more space in Kyrgyzstan for people to explore religion (in all the ways one can do that) than there has been in the other post Soviet Central Asian countries. As a result, a diversity of religious belief and practice has arisen, whether we think of the different interpretations of Islam that we find in Kyrgyzstan or the other religions that are also present in the country. This kind of variety is fairly unique to Kyrgyzstan, as is the degree to which religion can be a public matter. That said, however, Tajikistan had an Islamic political party for some time, something not seen in Kyrgyzstan. Your book is about the late Soviet and post-Soviet period. In what ways did secularism change between the two periods, and what makes Western and Soviet secularisms different? My main argument is about the condition of religion in two different political projects of secularism and what kind of public religion a secular state allows and cultivates, whether intentionally or not. My assertion is that the Soviet state only permitted public expressions of religion when they were tied to national identity and therefore were about belonging. This butted up against visions of religion circulating in Kyrgyzstan around the turn of the millennium that asserted that religion was essentially about belief. So my book charts this tension between how religion—as a category—is defined and how this relates to different secularisms. My fieldwork was done in the post-Soviet period and the main ethnographic argument I make is about the early 2000s. I describe and discuss the way people were living Islam, including their varying opinions and practices, and how they debated what was right, true, or necessary. These debates kept coming back to the idea of Muslimness. I realized that the majority of my interlocutors who came to maturity during the Soviet period insisted on a definition of Muslimness that was about belonging, rather than one in which belief was central. It’s easy enough to say this, or to say what has often been said in the literature—that ideas about being a Muslim and being Kyrgyz or being Uzbek are strongly intertwined and that this idea emerged during the Soviet period. I have made this argument in articles, as have many other scholars. But I began to wonder why this was the case and if there wasn’t a larger story to tell, one with implications beyond Central Asia. This led me to think about the Soviet state, its policies and practices, and in particular its variant of secularism. My starting point was Talal Asad’s work on secularism, in which he argues that part of the political project of secularism is to monitor and reinforce a particular idea of religion. This idea of religion—religion as essentially about belief—is, in part, the root of the liberal secular state’s power. I therefore began to wonder if the Soviet state had not (unintentionally) crafted and protected a different notion of religion than those cultivated in other secularisms. That is my main hypothesis—that the Soviet state cultivated a publicly acceptable notion of religion that was essentially about belonging, whereas other states have predominantly crafted one in which belief is the most essential element. These varying definitions of religion fit the social, political, and economic logics of the modern states that authorize them. This argument is made less for the reader of Central Asian Islam and more for the reader of secularism studies. The Soviet and post-Soviet experiences have rarely been considered in this literature. I think that scholars of the (former) Soviet Union have much to contribute to theories of secularism. Sonja Luehrmann’s and Catherine Wanner’s works are excellent examples of the way in which the (post-)Soviet experience can enrich our theories of secularism. I hope my work makes a meaningful contribution as well. Bride and groom presentation at the evening party of a wedding ceremony, 2004. How is secularism shaped? What modern forces can feed into secularism, not only in Kyrgyzstan but in Central Asia as a whole? Following Talal Asad, I see secularism as a political project. It is shaped by the logics and workings of the wider political economy, and the particular notions of religion and the secular emerging and circulating with it. That’s why we see a very particular kind of secularism during the Soviet period, given the distinctiveness of the Soviet political economy, but also its history of the secular as it emerged in conversation with Russian Orthodoxy and Islam. Post-Soviet secularism has had its own trajectory. It was constructed from legacies of the Soviet period, for example the intertwining of religious and ethno-national identity. This particular element has remained strong throughout Central Asia. Throughout the region you see secular states that advocate certain interpretations of Islam and insist on the inherent Muslimness of their titular nationalities. At the same time, in Kyrgyzstan at least, you have practices, institutions, and notions of secularism from Europe and the US that came with restructuring programs following the collapse of the USSR. And each of the five nations have had specific political and economic trajectories since 1991 that have dramatically shaped their respective secularisms, from the civil war in Tajikistan to the authoritarian rule of Karimov in Uzbekistan, for example. 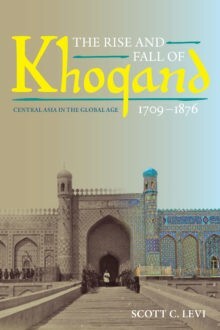 It is an interesting moment to study secularism in Central Asia, especially given the dynamic ways Central Asians are connecting to the world through migration, trade, and communication technologies, not to mention the modes through which the world is reaching out to include the region in its global flows. What are some personal stories that you tell in the book and what makes them special? Well, there are quite a lot of personal stories in the book. I think the most well-known is Mukadas Kadirova’s life story. I discuss her religious transformation and I situate this in the context of the broader changes in the town and country as it moved from a socialist republic to a capitalist nation-state. Mukadas was a fascinating person to follow. We were friends before I started my research, so it was only natural that we would spend time together when I returned for my fieldwork. She was attending a home-based school for religious education, so she started introducing me to the other students and, importantly, teachers she knew. While I was there, she and I also had many conversations about her own practice of and ideas about Islam. Her decision to change the way she wore her headscarf happened while I was there and I followed first-hand all the dilemmas—religious, social, financial, and aesthetic—she faced during that process. We went shopping together, tried out scarves together, etc. It seemed only natural that I write about her life and her struggles. Mukadas wanted to wear her headscarf in a way that more fully covered her head, neck, and shoulders, but it was a hard choice. She and her husband did not earn very much money, so buying a new wardrobe was out of the question. The most she could afford was one new dress and one new headscarf, and even that was a financial burden. But Mukadas loved high-quality fabrics, had an eye for color combinations, followed trends and wanted to be fashionable. She would not wear just anything. So she struggled. She also struggled with the way she thought her family, her neighbors, and other residents in town would perceive her. This worry proved to be well-founded, as she was yelled at in the bazaar and people gossiped about her. Knowing we were friends, people would ask me about her and her decision to wear her scarf in the manner she did. Actually, this is a rather mild way to put it. People were very suspicious of her and brought their worries about her to me. The variety of ways to wear a headscarf (or not), 2003. Given that she had strong memories of the Soviet period and talked frequently about her deceased father, I started doing a life history with her. I knew her mother, maternal grandmother, sisters, and other family members quite well, so I began to include them too. Because the stories I had collected about her and her family were so rich and because they reached back into the mid-to-late Soviet period, I began to think of her life and her choice to change the way she veiled against the backdrop of larger familial, social, and political processes. This slowly grew into the chapter about her life. But there are other stories that I am fond of as well—the life story of Tajideen-aka, a prominent religious leader in the post-Soviet era, for example, or two different stories of women who tried out the veil. What I like about all of these stories is the way we see how complicated lives are. And in the cases of the women who experimented with the headscarf, we get a sense of the everydayness of the veil, rather than all the heavy symbolism people usually ask it to carry. We see women approaching the veil with playfulness, ambiguity, and aesthetic concerns. Men milling around the mosque after prayer, 2003. What conclusion do you draw? What corrections to religious studies do you think should be made? My biggest conclusion is actually in the field of secularism studies and/or the anthropology of secularism. Here, I invite people to consider the Soviet experience in their theories of secularism. The majority of theories are based on the Western European or North American examples. My argument is that the nature and functioning of Soviet state was congruent but not identical to other modern states, including vis-à-vis the nature and functioning of its political project of secularism. Therefore, we should expect similarities, but also significant differences. The aspect I explore in my book is the definition of religion in the context of this secularism. I show the contours of publicly acceptable religion that developed with Soviet secularism. I argue that during the late Soviet period, the only form of public religion tolerated by the state, in Central Asia at least, was religion as an aspect of national belonging. This is different from theories on religion in European secularisms, in which the state could only allow religion to be about individual belief.